W Polsce najprawdopodobniej dostałby kilkanaście lat temu instalację gazową i woziłby na targ, w zależności od rejonu kraju – kartofle, pyry albo grule. W Anglii? Większość skończyła podobnie… z tym silnikiem wg rejestru zostało ich według sprzedającego tylko 6 sztuk. Cena nie jest niska, ale na szczegółowych zdjęciach doskonale możemy zaobserwować, jak doskonale wykończony był Mercedes S123. 1979 Mercedes 250T AUTO, probably the rarest model in the S123 range-currently only 6 remain in the UK according to DVLA records. Veiwing recomended to any serious potential buyers. DB880 AGAVE green exterior with a Date Herringbone cloth interior. 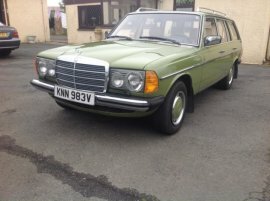 This W123 estate is in very good condition all round and has been well maintained. The mileage is at 146K miles and it has clearly been well maintained over is lifetime. You will struggle to find another like this in the UK outside of specialist dealers. 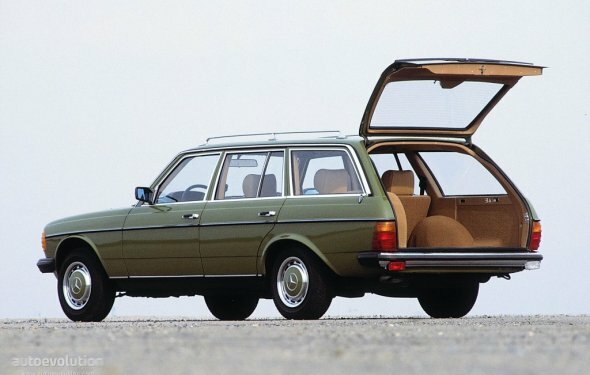 The body is in exceptional condition with no known rust issues common to W123 models. Even the rear arches are original. There is a sticker on the drivers door jamb claiming that it has been treated with Dinitrol since 1994 so this has helped. There are one or two small chips/scratches here and there but nothing that detracts from the appearance. All door check straps are good as are the tailgate gas struts. All brightwork and chrome is very good-not cloudy like many. This car is fitted with the 2.5 litre straight six M123 engine. It has a 4 barrell carb and runs very well. Recent head gasket and waterpump replacement. Keeps up with modern traffic with ease and runs very smoothly. The self levelling suspension has had 2 new spheres and replacement drop links and bushes. Steering is free from play and has had a recent drag link and damper replacement. The interior is as good as it looks in the photos. I have sourced original NOS Mercedes carpet to replace the originals as they had faded. The results speak for themselves. I have taken great care to replace any trim peices that were even slightly damaged. All seat bases are good and even the drivers seat bolster is unworn.